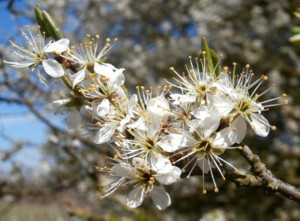 A real favourite of Dr M, and a sure sign that spring is with us, is Blackthorn, Prunus spinosa. Its pure white blossoms emerge before the leaves and so are set against the very dark, leafless, spiny twigs, surely one of nature’s simplest, coolest and mouth watering colour combinations. 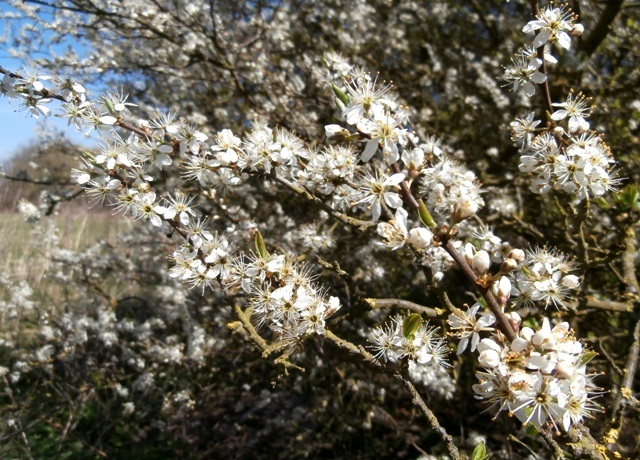 Blackthorn is one of several white flowered shrubs native to Britain but these don’t tend to flower together, rather they bloom in sequence from spring into summer. Blackthorn kicks off the year being at its best in April, the clear white flowers of Hawthorn follow in May (indeed ‘May’ is one of the common names of Hawthorn), finally the creamy white saucer-shaped inflorescence (technically corymbs) of Elder adorn the hedgerows from June. These three are also bounteous, Blackthorn flowers ripen into sloes for sloe gin, possibly the most delicious drink that nature (with a little help) can offer, Hawthorn offers its fruits the ‘Haws’ as fodder for birds and indirectly benefits us by their presence and beauty, and finally Elder offers, surprisingly for such a stinky plant, blossoms for Elderflower tea, cordial and of course Elderflower Champagne and Elderflower wine, and eventually berries for, well for more wine! Identification: To some extent flowering time helps separate these three white-flowered shrubs, but Elder (in the Caprifoliaceae) is easily told apart from the other two by its grey bark with prominent lenticels (breathing pores) and when you split the twigs there is an extensive soft white pith and the whole plants reeks with that characteristic rather gross, cat-pee like Elder odour! Blackthorn and Hawthorn are both in the Rosaceae and so are more similar to each other, but it is still pretty easy to tell them apart. Blackthorn has dark, even black twigs, bearing perpendicular lateral spines and also terminal spines, the spines themselves may bear buds and flowers, the leaves are narrowly oval and toothed. Hawthorn on the other hand, has greenish brown or dark grey twigs with lateral thorns, angled, not perpendicular and with no buds on them, the shiny leaves are characteristically deeply and variously lobed. Later in the year the fruits are very diagnostic being purplish ‘sloes’ in Blackthorn and red ‘haws’ in Hawthorn. Enjoy the recent images of Blackthorn above and I’ll post images of the other two later in the year as they come into flower! Dr M on other white flowered trees and shrubs: Hawthorn here and Elder here.